Fascinated by the conundrum of where the biblical figure King Solomon had acquired his vast reserves of gold, Shah sets out to find its reputed source in Ophir, which he believes to be located in modern day Ethiopia. Shah's 2002 journey, accompanied by two reluctant Ethiopian travelling companions, is an absorbing one which takes him into the hinterlands of Ethiopia. His travels in search of the mines showcases both reasonably well known places such as the rock-hewn churches of Lalibela and lesser ones such as Nejo (the Garden of Eden) and Harar, where we are introduced to the hyena man Yusuf Mume Salleh, who fed the hyenas for 45 years. In doing so we get to see the many faces of Ethiopia which make up this fascinating country and one well worth visiting. Of particular interest is Shah's journey with the Danakil tribe where he travels as part of a salt caravan. In bygone eras the Danakil would wear the testicles of their vanquished enemies and we get a wonderful insight into what is, very much, a disappearing way of life. Likewise, his visit to one of the last Beta Israelis in Ethiopia who didn't take part in the mass exodus in the 80's and 90's simply illustrates just how wonderfully rich and diverse the country is. 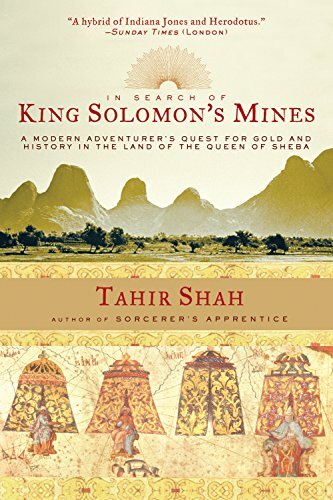 While In Search of Solomon's Mines fades a bit into the finish, if you're looking for a travelogue that provides plenty of background information to Ethiopia then search no more, as Shah has produced what is a golden story and one well worth reading.